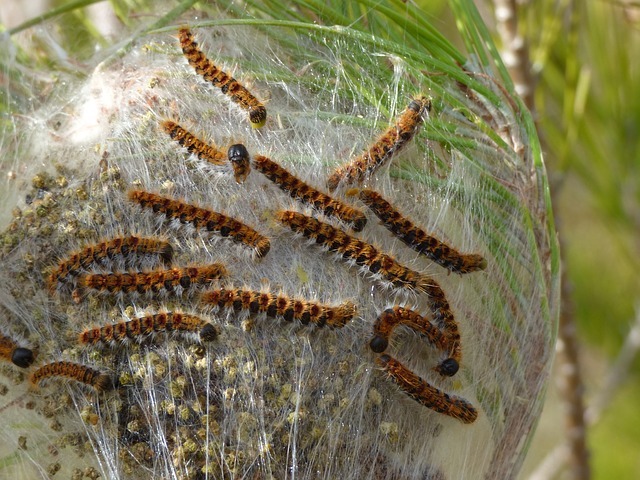 We have seen reports of Processionary Caterpillar nests around various sectors on Camposol. Remember, like every year at this time, be careful with your dogs when you take them for a walk because they very poisonous. With these windy days the caterpillars can be everywhere! The hairs of this caterpillar are VERY POISONOUS for DOGS and CATS and they need to be treated as soon as possible if in contact, the hairs are dangerous for humans too. My girlfriend advised me yesterday not to walk our dog on the campo near to us as she had noticed a Pine Processionary Caterpillar nest in one of the pine trees on Sector D.
I drove past the trees, which are on the campo side of Calle Esparraguera, to see if I could see it. I’m not sure if you are aware, but these caterpillars are lethal. The hairs from the caterpillars are toxic and can penetrate and irritate skin. The toxic hairs will transfer to an animals tongue when they lick the irritated area, leading to swelling, and, if not dealt with quickly, death. I’m not sure, from the website, if it is the third stage (living in the nest) or the fifth (leaving the nest) which takes place between February and April. As mentioned above, these caterpillars are lethal, and I’ve seen a lot of dogs being walked along that area of campo, and concerned that residents may be unaware of this threat to their pets. Unfortunately the gardening group are not licenced to remove these creatures. 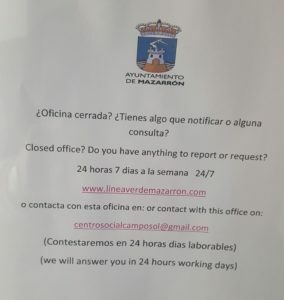 You can either report it to Antonio Hernandez Benitez at the cultural centre on B and he will contact the relevant department at the Town hall. Alternatively you can report it via Linea Verde app or visit the Town hall and report it in person. Personally I would suggest the most straight forward approach would be via Antonio he is very proactive in these situations. Antonio at the Cultural Centre on B Sector: Monday, Tuesday, Wednesday and Friday between 10:00 and 17:00, and Thursday between 15:00 and 17:00. A search on Google will reveal multiple web sites giving more on these creatures.